As far as a translation, I think I have it in hand. From the search box on that page, enter "le tarot dit de Charles VI" to get to the others. The best way I have found so far to get images from Gallica is to click the "print and download" link on the left (an arrow pointed down at a tray), and then download a .pdf of the whole page, from which the images can ve extracted by the adobe .pdf reader (I'm told) or by using one of the "get images from a .pdf" services. Make sure you download the page with the image rather than a thumbnail of it. While I don't know much about coats of arms, two pages of image results from a search for the Medici arms did not return any cases where seven dots were arranged in this pattern, with one in the middle. Here is the Medici coat of arms. Here is a provisional translation of Alain's essay on LeTarot. The only awkwardness was in translating "plusieurs devices", which is ambiguous in the original between "several suits" and "many devices" i.e. heraldics, although, according to Caldwell, Depaulis prefers "suis", i.e,. French "couleurs", because the word "devices" meaning heraldics is not documented in France before the 16th century. I have used Caldwell's translation of the passage but with a long explanation of the ambiguity inserted in brackets. I would welcome any suggestions for improvement. Note added July 10 : I have made two additions since original posting. In line with Huck's suggestion in the post, I have added the point about Sheggia and the Castello Urbino cards to the translation, with Alain's assent. I assume that Alain will add it to the French. Also, I have added what the letters " SGDL" next to Alain's name stand for, as confirmed by him. Who could be the painter of the images of the TdChVI? 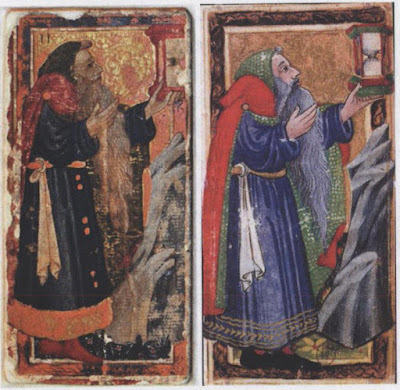 Giovanni di ser Giovanni Guidi (called Scheggia), Italian painter and miniaturist, San Giovanni Valdarno 1406-1486, would be a very plausible candidate for the realization of the images of this deck - for two reasons. (2) He painted the birth plate illustrating the "triumph of fame" for the Medici family on the occasion of the birth of Lorenzo, who became "Il Magnifico" (ibid). 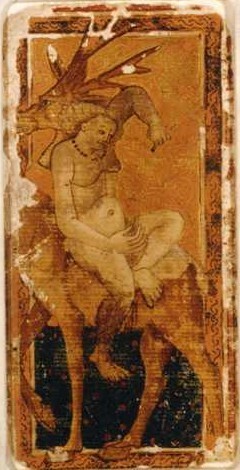 Therefore, Scheggia would be a natural choice of the painter of triumph cards for the same family, perhaps for the same Lorenzo. Alain BOUGEAREL of the SGDL [Société des Gens de Lettres de France]. The only difference is the color in the middle. The Scheggia argument developed from the observation of 2 pictures. 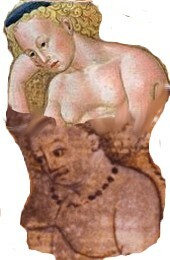 The breasts of the two nudes are painted in an unusual manner, possibly a personal style of Scheggia. Yes, good addition, Huck. The thesis that Scheggia did the cards should probably read something like this. (1) He is a painter documented as producing playing cards (see Franco Pratesi at http://trionfi.com/evx-lo-scheggia). 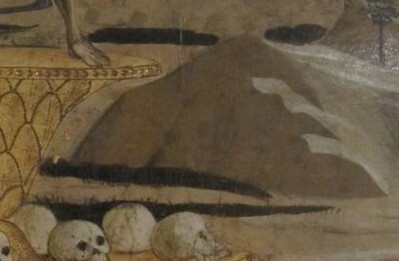 Then the point about the birth tray would be point 3. This point would be less persuasive if other painters of the time also painted heads and breasts similar to those on the Urbino card. Emilia Maggio sees a similarity to work of Apollonio di Giovanni, which is perhaps why I was hesitant to suggest your argument to Alain. But once I saw a larger image of the Apollonio, I was sufficiently unimpressed with her comparison to think yours is significantly better. I cannot at the moment find the image on the Web (it is of Cupid in an illuminated manuscript of the Aeneid). I will post it when I do. I compared the two back in 2014, along with the Cupid on Apollonio's Triumph of Chastity, at viewtopic.php?p=15290#p15290., as well as posting the relevant part of Maggio's article. I came to the same conclusion then as I do now. 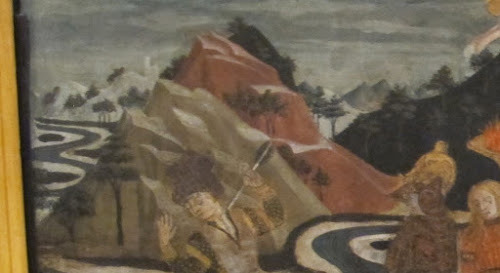 On the other hand, the rocks in the Cupid and Venus look more like the rocks on the Hermit card of Urbino and the TdChVI (https://encrypted-tbn0.gstatic.com/imag ... Q6ORsZ_w-r) than Scheggia's rocks on the birth tray or his Triumphs (e.g. https://upload.wikimedia.org/wikipedia/ ... rte_01.JPG). But rocks are less interesting and distinctive than breasts, and perhaps there are some comparable rocks somewhere in Scheggia's works. 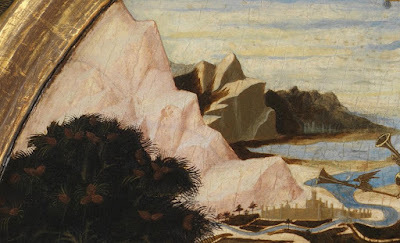 Actually, in the way Apollonio paints rocks, I'm beginning to wonder if the ChVI perhaps is his creation rather than Scheggia's. This does not to cast doubt on Sheggia (and workshop) as the creator of the Catania. But the ChVI simply has more of Apollonio's style, compared to the Catania. Notice the rocks in the one on the right compared to the one on the left. It may well be just that the one on the right has been taken better care of than the one on the left, but I'm not convinced that's the case. On the World card, there is some nice shading on the robe, absent from the ChVI. It may be that the ChVI was retouched in a later century by someone incompetent. The PMB Hermit, for example, looks to me clearly retouched, if only from the brightness of the colors, as opposed to . Well, I'm no expert, and you never know what is the product of retouching in a later century and what is not, and what is by the master and what by an assistant. But I think there is enough difference between the two to wonder whether Apollonio (& workshop) - or even somebody else - might not have used Scheggia's design in his own particular but very similar style to create the ChVI. Apollonio was born 1414, died 1465, after which his partner's son apparently took over the shop. Scheggia was born 1406 and died 1486. Apollonio was born 1414 and died 1465. Apollonio learned his trade later than Scheggia, and similarly the style of the ChVI looks later than that of the Urbino. 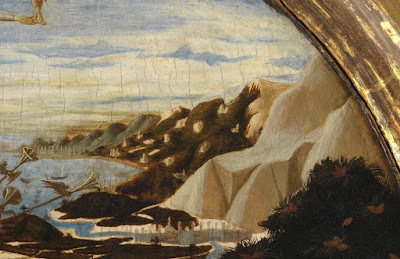 Yes, it's only 8 years, but it was at a critical time in the development of Florentine art. There is not enough reason to positively discount a connection to Scheggia, just reason to wonder, So the attribution of the ChVI to Scheggia remains speculative..
With Alain's approval, I have added Huck's point about the connection of Scheggia to the Ursino/Catania cards to the reasons for thinking he might be the artist of the TdeChVI as well. I have also said what the initials after his name are for "Société des Gens de Lettres de France". I m been away some time. Thanks Huck and Mikeh for your contributions. Yes, the TdChVI "painter" remains enigmatic. Unknown artist ? Scheggia or Appolonio (workshops)? D) Quel pourrait être le peintre des images du TdChVI ? L artiste est non identifié à ce jour - inconnu voire anonyme.